Ugh.. it’s almost 11 and my eyes are totally feeling so heavy. It’s time to force myself to go to bed. I have been playing tonight in my ‘art journal’…I have been trying to just a little something creative everyday! That is the beauty of an art journal. You can just dabble in it, nothing has to have a start or finish. I have been using it as a journal- I want to remember all this stuff. So I can look back and laugh! (wink)… I indulged myself tonight and bought some new music on i-tunes and have been listening to music instead of watching TV. (I am so OVER EVERYTHING on TV! )… so I bought some new Gwen, Rob Thomas, the Fray and a new artist that a few different people have told me about… her name is Colbie Caillat. She is a totally mellow singer/songwriter chick. It’s total chill out beachy music. She sings the most amazing beautiful song called “Capri”. Thanks Lauren for sending the lyrics. As if I am not emotional enough w/ the pregnancy hormones still RAGING, and my little sweet Capri only a week away from her first birthday. Seriously, can she possibly already be a year old? Check out the song, it’s so beautiful! Sigh, why am I still up? The house is SO quiet… I hate to waste the silence on sleep. It’s kind of like sleeping through a massage! Such a waste! But Connor will be up in 2 hours. I can’t believe he’s a month on sat. Speaking of time flying... Creative Escape is only 35 days away! Yee-haw! get to bed you will regret it in the morning!!! Hoping that you can "do" Creative escape in Australia one day, WE LOVE HEIDI SWAPP!! I should be in bed too! Wasting time reading blogs when I should be sleeping. I think I too enjoy the silence. Have a great trip, and Happy birthday to Capri! So funny..I have been listening to her for awhile, love Colbie! I thought of you every time with the Capri song, as you are the only one I know with a child by that name! I agree, she is an awesome singer..love her! from one Capri mum to another...how cool that there's a Capri song - I'm off to find it and have a listen!! happy birthday to your Capri..
happy soon to be ONE capri!!! Have a great trip to Utah!!! Can't wait to see what fantastic goodies you will be offering on QVC, I already have it ready to record on my DVR. When I first heard that song the first person that came to mind was you and your beautiful daughter Capri. So glad someone sent you the lyrics. It is such a wonderful mellow song. Wow a year old already. Wishing her a fun filled first birthday. Love the mug. I was just looking through your online class, and I noticed that it looked like you served a mission to Brazil. Is that the case? Or maybe Portugual? I saw the missionary badge and it looks just like my sons. I was just working on his scrapbook for his mission and noticed that the 2 looked alike. Wow! Just one more reason to idolize you! You never cease to amaze me. By the way, my daughter's name is Kolbi! i just finally read that you had hiM!!! what a doLL!!! my sister and i are 10 months apart so i LOVE when someone else has babies that close! brings back memories!!! how fUN!! enjoy! Love the song! And LOVE the coffee mug!!! That song is amazing! I am a few weeks away from having my fourth child,and I totally can relate to you about the whole hormones thing!! The lyrics definitely had me tearing up. so glad you enjoyed the song & the lyrics! what a sweet sweet song. yes, you must use it in a layout. 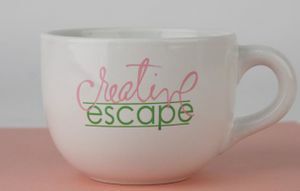 I can't wait to use one of the mugs at Creative Escape!! Only 35 days....wow!! So excited!! Yikes, that month went fast!! I know what you mean about not 'wasting the quiet' on sleep! just had to add...i love depeche mode. Im in your class and Kings of Conveneince fun to listen to while you are scrappin. TV is just trash now a days. Just wanted to let you know that they are awesome! cool mug ... you know how i have a thing for mugs! that is very cute! love the song lyrics. who wouldn't get a little teary listening to them. you are an inspiration to all mum's. have fun at the reunion. Among all the beautiful things you create, your babies top the list! Lavish the moments of the little ones, they grow up way to fast!